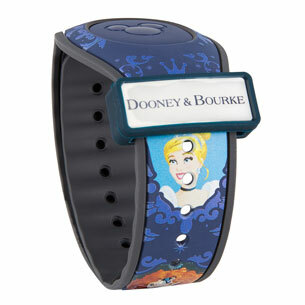 Brought to you by our friends at WDWMagic.com. Beginning February 5, 2018, guests staying at Disney's Pop Century Resort can request Minnie Vans to take them anywhere on Disney property. The cost is $20, and service can be arranged from the Lyft app. The 2018 Epcot International Flower and Garden Festival is less than a month away and we now have the complete run-down of all the menus at the 15 World Showcase Outdoor Kitchens. The 2018 Epcot International Flower and Garden Festival will take place over 90 days, from February 28 to May 28, 2018. A New Outdoor Kitchen for this year is The Honey Bee-stro. Click here to check out our post with the full menus and pictures. A new Magicband color, cream, will be available on a limited release Dooney & Bourke MagicBand that will come in specialty suitcase-themed packaging and may be purchased exclusively in the theme parks for $48 plus tax. 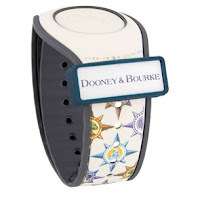 Another Dooney & Bourke-branded MagicBand, with a limited edition size of 500, will be offered at the 10th Disney Princess Half Marathon Weekend expo beginning on February 22 while supplies last for $48 plus tax. Disney has confirmed that the long-rumored name change for Disney's Hollywood Studios is no longer on the table, at least for the foreseeable future. In a post on the official Disney Parks Blog, Disney said, "In response to questions we have been receiving, we also want to let fans know that the Disney’s Hollywood Studios name will remain the same for the foreseeable future since we are immersing our guests in a place where imagined worlds of Hollywood unfold around them from movies and music, to television and theater." Names such as Disney Hollywood Adventure were thought to be likely candidates, but it now seems that Disney will not move forward with the rebranding. 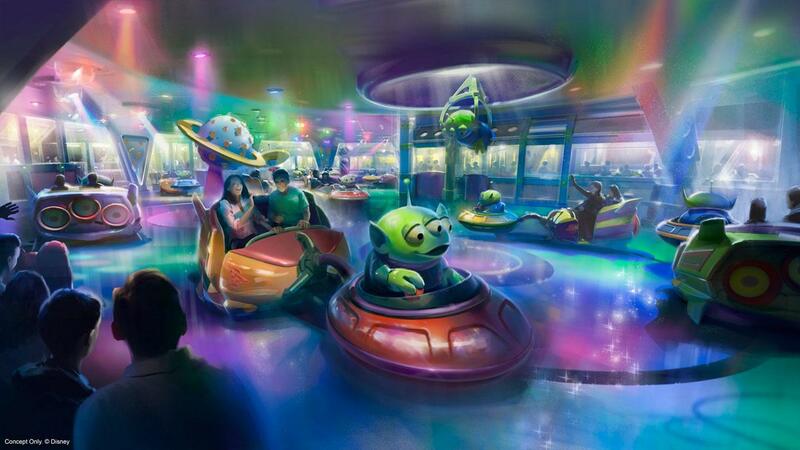 Disney revealed some new concept art of the upcoming Alien Swirling Saucers in Toy Story Land at Disney's Hollywood Studios. You might recognize the ride as being a clone of Mater's Junkyard Jamboree from Disney California Adventure, but at Walt Disney World, the theme is aliens and flying saucers. Disney describes the experience as, "Once the aliens have powered up their flying saucers, you’ll get to climb into a toy rocket and hang on as aliens lead the way on an interstellar romp set to an out-of-this-world beat. And if you’re really lucky, you just might get “chosen” by the claw!" 'Walt Disney Presents' at Disney's Hollywood Studios will be showing a sneak peak of 'A Wrinkle in Time' from tomorrow. Beginning February 9, 2018, you will be able to see a display of production costumes and a preview of the movie. Steve Harvey's daytime series 'STEVE' is traveling to Walt Disney World Resort for an all-new week of shows set to air March 19 - 23, 2018. 'STEVE' will be recorded March 9 -11 before a live studio audience from Epcot at Walt Disney World. The week will feature celebrity families and couples including The Bella Twins, Eric Christian Olsen and Sarah Wright Olsen, Tracey Edmonds and Deion Sanders, Boris Kodjoe and Nicole Ari Parker as well as celebrities Josh Henderson, Terry Crews and more. True to 'STEVE' form, these special episodes will be filled with exciting games, prizes and giveaways. Viewers will learn about an incredible summer in store for Walt Disney World guests, which includes the opening of Toy Story Land at Disney’s Hollywood Studios. One deserving couple will even get the wedding of a lifetime after their hometown wedding landed the bride in the hospital. Throughout the week, the couple’s family and friends will help celebrate with all things Disney to make the couple’s dreams come true. Steve will also proudly honor students from the 2018 Class of Disney Dreamers Academy with Steve Harvey and Essence Magazine. Disney Dreamers Academy is an annual empowerment program featuring 100 select high school students from across the country who are looking to dream big and learn how to put dreams into action. The academy aims to prepare students for the future by developing networking and interviewing skills and showcasing a variety of career opportunities. This is the first time the show has visited Walt Disney World and the first time the show has filmed from a remote location since its premiere this past fall. To attend a 'STEVE' recording at Walt Disney World, visit www.getstevetix.com. The Speedway Gas Station at the Transportation and Ticket Center near to the Magic Kingdom will be closing for a lengthy refurbishment. Beginning February 12, 2018 and lasting for several weeks, the refurbishment will include a new Speedy Cafe, offering quick service food with both indoor and outdoor seating. Ordering takes place at self service screens, and then each item is freshly made to order. Read more about Speedy Cafe at the Speedway site. Menu items will include pizzas, paninis, coffee, breakfast sandwiches, frozen yogurt and more. During the closure, the other Speedway locations at Disney's BoardWalk Resort and Disney Springs will remain open as normal. Looking to plan your next trip to Walt Disney World? Contact the agents at Kingdom Konsultant Travel to help you plan your dream vacation. Email vacations@kingdomkonsultant.com for a free quote today.